Eyeglass Rescue’s special Long-Term Care Facility product enables you to identify and return misplaced eyeglasses to the patient that owns them. It is a simple, low-cost solution that effectively eliminates resident inconvenience, staff time wasted while identifying found eyeglasses, and the time and expense needed for the replacement of lost eyewear. 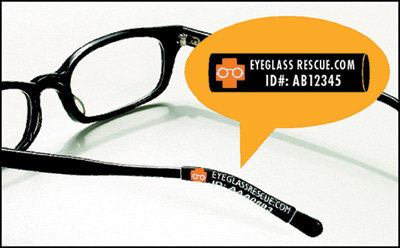 Eyeglass Rescue’s Identification and Protection Sleeves are easily shrink-fitted onto the temple bar of a pair of eyeglasses. When attached, you will be able to readily identify the owner of each pair of glasses from the unique code printed on each Identification Sleeve. They are comfortable to wear and essentially invisible when the eyeglasses are being worn. Each order includes clear attachment instructions. In addition, each order comes with a chart that contains a list of all of the identification numbers on the sleeves that you have ordered. You simply write in the patient’s name on the chart next to the identification number that is on their Eyeglass Rescue sleeve. We realize that you provide an important service to your residents and your community. We would be very pleased to work with you to support your standard of excellence in residential care and staff productivity. “Rogerson House is an Assisted Living community in Boston, Massachusetts that cares for individuals with memory loss. At our community, the loss or misplacement of our residents’ eyeglasses is common. This often results in an extensive and unnecessary amount of time spent by our staff looking for the eyewear and adds an unnecessary amount of stress to our residents when their vision is impacted. Eyeglass Rescue has reduced the amount of time that our staff spends looking for misplaced items, therefore increasing the amount of staff time for quality patient care. Our residents are comforted when their "lost" glasses are identified and returned to them”. “We use Eyeglass Rescue on all of our resident’s glasses. By marking the glasses at our Home we can better identify any misplaced glasses. This sometimes occurs in the beauty shop and whirlpool room. We've had great success with your program! Thank you for having such a wonderful service”.